Walkway lights serve several purposes, such as keeping your guests and your landscaping features safer, as well as enhancing the visual appeal of your yard. The key is choosing the right path lights for your project to ensure proper illumination and a look that will complement your landscaping and your home’s architectural features. Here are five reasons to install walkway lights, as well as tips and ideas to help inspire you. 1. Guide Your Guests: Walkways are meant to guide traffic and lead the way to your front door, to outdoor living areas or through your garden. If your pathways are ever used in the evening, early in the morning or after dark, walkway lighting is essential in allowing your walkways to serve their primary function. 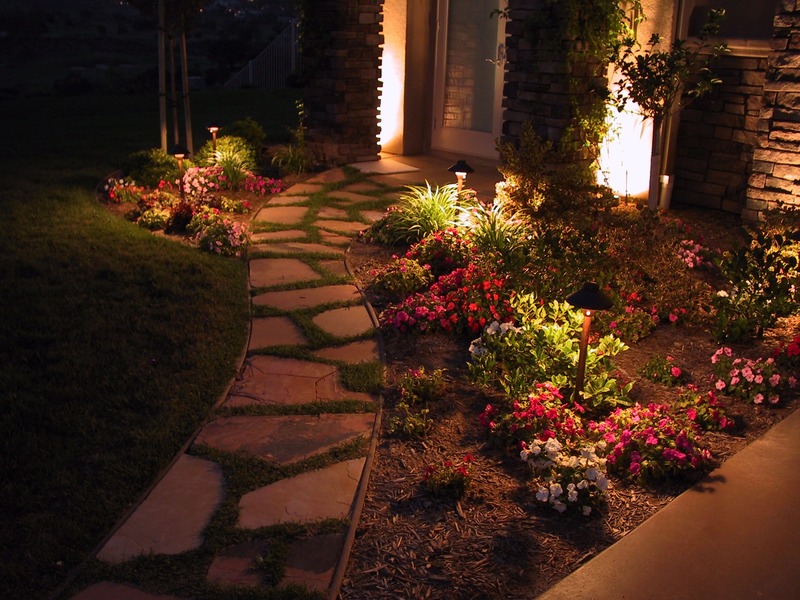 Path lights guide your guests from parking areas to your home and help them easily go between outdoor entertaining areas after the sun goes down, which makes them an integral part of landscaping design for frequent hosts. 2. Increase Safety: Illuminating walkways keeps you and your guests safer by casting light on potential tripping hazards and defining walkway borders to keep you on the designated path. As an added bonus, any type of landscape lighting helps increase the security of your property by illuminating your yard and making your house less appealing to potential intruders. 3. Protect Your Plants: Providing your guests with well-lit, easily identified, designated walking areas will help keep them from walking across your lawn or mistakenly stepping on plants and flowers. This means that walkway lights not only increase the safety of your guests; they also keep your plants and other landscaping features safe. 4. Enhance Visual Appeal: Outdoor lighting serves functional purposes, such as making your walkways safer and controlling traffic, but it can also be an attractive finishing touch that can completely transform your landscaping. Pick a style that complements your landscaping and architectural features and see just how much adding a well-designed lighting system can instantly improve the look of your yard. 5. 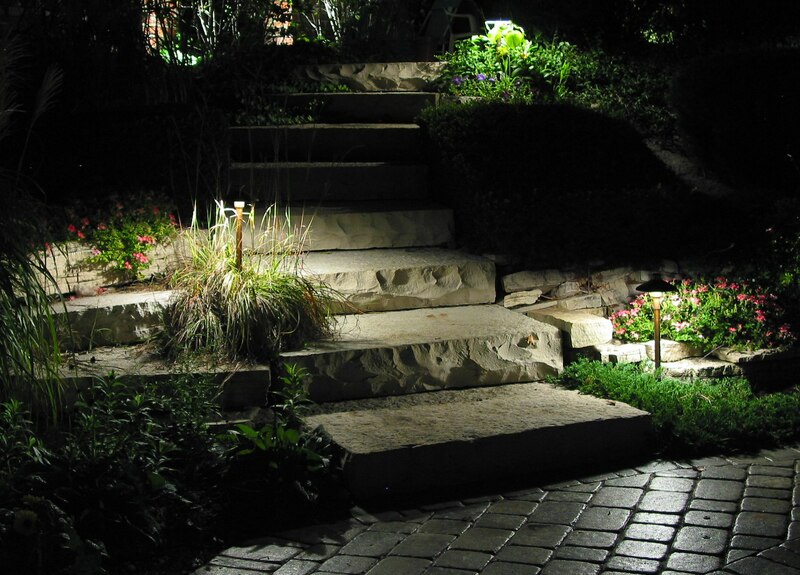 Upgrade Your Walkway: Adding walkway lighting is a great way to upgrade any type of walkway. For example, you can add even more visual interest to an existing paving stone walkway by adding lights along the border. You can benefit from this upgrade option even more if you have a simple gravel, bark or wood chip path that could use a bit of elevation in the style department. 1. 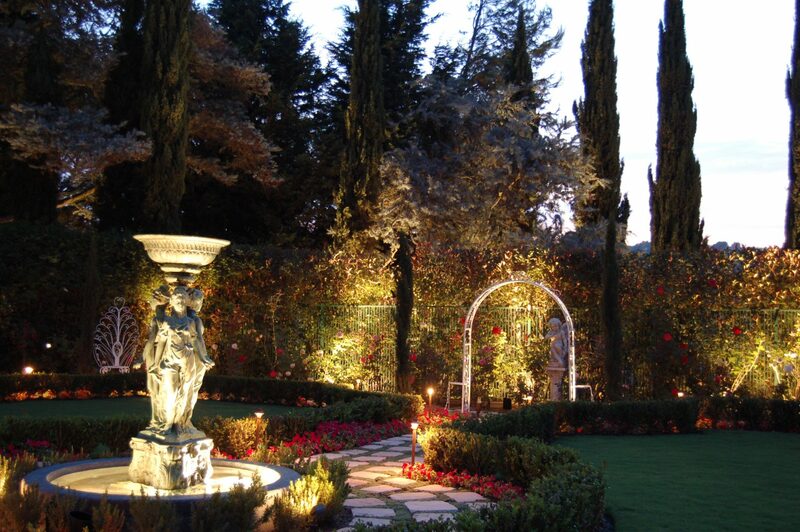 First and foremost, your path lights should be part of your overall landscape lighting design. Some homeowners add walkway lights almost as an afterthought, which can take away from the cohesion and overall visual appeal of your lighting system. 2. Motion sensor lights can add visual interest as they illuminate one or two at a time as you or your guests traverse the path. This can give your landscaping a modern feel and add drama to your yard; however, you will need to consider that the area will not be illuminated when the walkway is not in use. This will be fine for some projects but will not work for others. 3. Like most outdoor lighting systems, path lights will be most convenient and serve you best when put on a timer, which will automatically turn them on and off each night. This can help save electricity and save you the hassle of manually turning on and off your lights. This also helps avoid situations where you forget to turn on your landscape lighting before guests arrive or family members return home from a late night at work. 4. In some cases, the best lights for walkways are solar-powered options. This is particularly true for those who do not want to have to worry about transformer locations or their dogs digging up electrical lines. For example, if the walkway you want to illuminate is a good distance from the nearest power source, solar pathway lights might be your best bet. Solar-powered landscape lighting that has no wires and does not need a transformer is also generally easier to install in areas that are particularly rocky, steep or difficult to get to. 5. Even in sunny Southern California, solar lights are not always the best option. While they are an excellent solution for many landscaping projects, there are particular circumstances where you may not achieve a satisfactory result. For example, walkways that are close to structures or under trees and do not receive adequate sunlight may not be good candidates for solar-powered landscape lights. Your outdoor lighting professional can help you determine the best lighting options for your project. 6. When most of us think of walkway lighting, we think of the typical light fixtures commonly seen lining paths in residential settings. These usually consist of a globe atop a short post that casts light from just above the path. This type of outdoor lighting is easy to find, can be quite attractive and serves its purpose well. However, do not feel bound by this one style of lighting simply because it is what we most often see. There are many other ways to light walkways and one of those might better suit your needs. For example, you can illuminate your walkways with lampposts, downlights mounted on a fence or other structure, under-eave lights for paths adjacent to buildings, wall lights or sconces, step lights, or downlights placed high in trees to create a more natural-looking moonlit effect. To learn more about walkway lighting or begin designing your outdoor lighting system, contact Install-It-Direct at (858) 925-3000 to speak to a design consultant today.